These wonderful and talented people will still be at The Del Mar fairgrounds tomorrow from 10am – 4pm. Please check them out! 1. 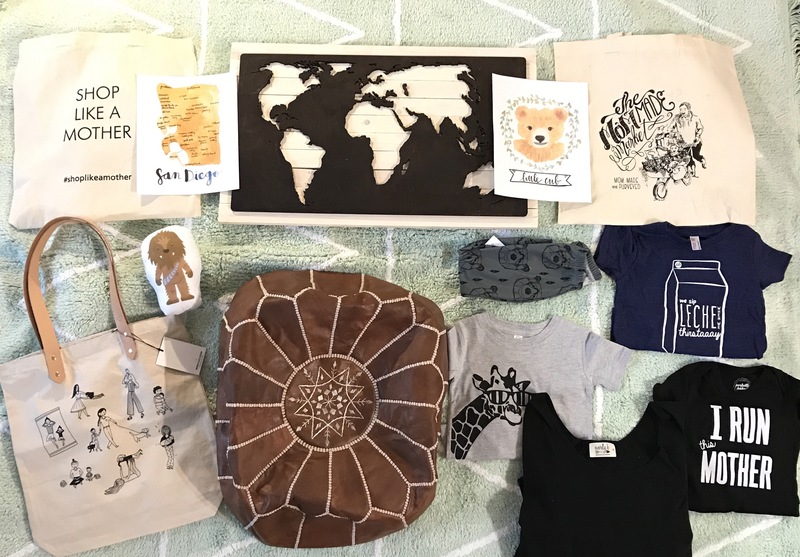 San Diego #shoplikeamother totes from The Mom Made Market. 2. San Diego and Little Cub watercolor prints by Happy Hart Co.
3. World Map Wood Art by The Treasure Hunts. 4. Canvas Tote with Leather Handles by Pepper Place Designs. 5. Mini Chewbacca Pillow by Little Fruit Tree. 6. Leather Macrame Cushion procured by Eclectic Collective. 7. Geometric Bear Joggers by b.haven. 8. “We Sip Leche” and “I Run this Mother” tee and onesie by Perfectly Baked. 9. Giraffe Tee by Bear and Little Bird. 10. Long Black Dress with pockets by EverlyB. I wish I could have gotten more, but my wallet thought otherwise 😂. If you aren’t in the area, please check out their work on their linked sites ! ← Postpartum: When Does it Get Better? The wood artists was amazing!